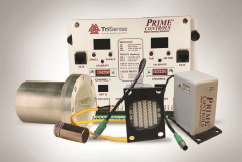 September 6, 2017, Dayton, OH – Prime Controls, a world-leading manufacturer of sensors and controls for the can making, automotive, appliance and other metal forming industries, is pleased to announce the unveiling of their newest product, the TriSense SD230, which expands on their current world-leading Double Shell and Missing Tab Detection Control offerings for high-speed EOE Conversion Presses. The TriSense SD230 system controls three functions in one package: double shell detection, missing tab detection and end light leak detection. By integrating our proven light technology system (models LH200 and SL100) with our double shell and missing tab detector, operators can run and manage all three functions at the same time through one control. Due to this 3-in-1 approach, TriSense SD230 provides customers with significant cost savings. In addition to being cost effective, TriSense SD230 is also simple to use. With only one controller for three separate functions, TriSense SD230 is easier to install, run and manage while offering operators access to more data than ever before. Troubleshooting is streamlined as all data comes from one controller. Spare parts are also available on demand. No long lead times. Technology is at the forefront of TriSense SD230. It presents customers with a more robust, user-interface compared to other products and its ET230 Communications Gateway delivers customers access to data and allows them to make changes on the fly or remotely without accessing the controls in the enclosure. “We are extremely excited about the launch of the TriSense SD230. It’s a product that was created from customer feedback and insight, what our company prides itself on.” states Graves. “We are eager to introduce this product to the canmaking industry where the need for reliable and efficient detectors are essential,” continues Graves. TriSense SD230 is available now for all new conversion press builds along with retrofits for existing systems. Contact Prime Controls or your preferred EOE Press manufacturer for more details.